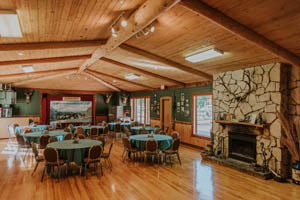 All facilities at Boundary Ranch are authentically themed for a traditional western experience for banquets, groups, meetings, parties, tours, weddings and much, much more! Each building features a hand crafted fireplace and its own unique charm. We endeavor to offer guests a memorable experience in various distinct spaces. The Food Service Team at Boundary Ranch specializes in the contemporary preparation of traditional barbeque and western menu items. Meals are served plated buffet style on blue enamelware. Function areas have round tables with coloured linen tablecloths that comfortably seat eight guests. Full Bar Service is available with your choice of a cash, host, or combination method of payment. This spectacular octangular room is a true western facility. 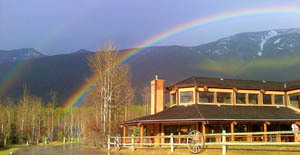 The Kiska Lodge offers a great space for larger group events with monumental log timbers reaching up to the skylights. The centre piece of the room is a hand crafted stone and iron fireplace. The room is adorned with historical artifacts which complement the traditional western atmosphere. 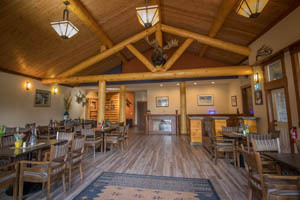 With a built-in bar, a stage for entertainment, and surrounded with windows and walk outs to the patio and fire pit, the Kiska Lodge is a magnificent facility to host your event. Built in 1987, the Elkhorn Hall is the oldest building on site and holds the most history of any structure at Boundary Ranch. It was originally built as a barn, but in 1989 it was transformed into a movie set for the film “Dead Bang”. The architecture of the original barn is still visible, and the space features couches in front of the handcrafted fireplace constructed from local stone to create a rustic and intimate setting for your event. The walls are adorned with a pictorial history of Boundary Ranch, the Guinn Family, and a variety of movies filmed on site. 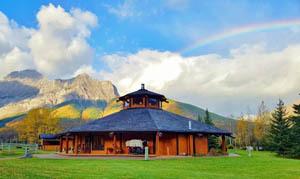 A walkout leading to the Elkhorn Patio and fire pit allows your guests to enjoy the wonderful view of Mount Kidd and the beauty of the Kananaskis range. This open concept building is supported by magnificent log timbers that reach up two storeys to windows that infuse the space with natural light. Caribou Lodge features a handcrafted wood burning stone fireplace. A private patio and covered boardwalk allow guests to enjoy incredible views of the peaks surrounding Boundary Ranch. This stunning vaulted room features examples of Canadian wildlife, relics of the wild west, and authentic native artifacts. Our newest venue located in the Guinn Family Wildlife Museum offers a fresh and historical atmosphere for your intimate group. Wildlife Museum tours available. 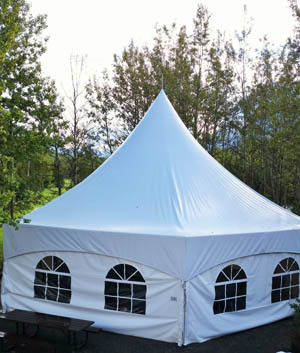 This marquis tent venue is available seasonally and allows for your group to enjoy the beautiful summer weather with a “big top” cover to shade you from the sun. All venues come with an attached patio and several have fire pits available for bonfires. Ask your event coordinator about adding a Marshmallow or S’more roast to your event! 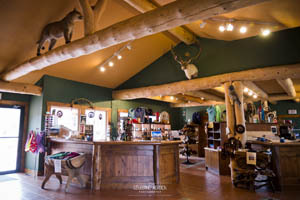 Our Gift Shop offers quality western themed goods, souvenir items, local handicrafts, and our own line of Boundary Ranch casual wear. 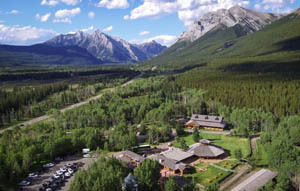 Please note that overnight accommodation is not available on site at Boundary Ranch, but there are a number of quality hotels and campsites in the area.